Meet Maverick our GSD. He is two and a half years old and we rescued him almost a year ago from the pound. When we got him he was skinny, scared and completely out of control. He has come a very long way. He is healthy, happy and fully trained. He loves other dog and loves kids. 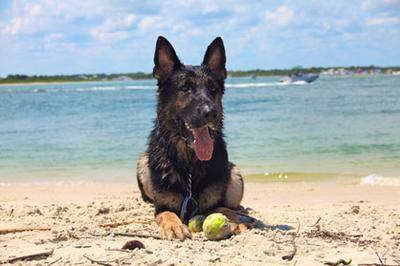 He absolutely LOVES his tennis balls but not as much as he loves the beach!!! I hope you consider him for GSD of the month, he definitely deserves it! Thank you so much for sharing your handsome boy Maverick with us all today! That is a beautiful shot of your German shepherd for sure. really, really nice. It's so nice to hear he's done so well since you brought him home. Good for you for rescuing him in the first place. I wish more people would take this important step. It would be so nice to see some of those shelters closed down for lack of occupants don't you think?! Continued success with your handsome German Shepherd Maverick. Maybe in the future you can send us some more shots of him - he is a real stunner for sure! Comments for Maverick our GSD! Your boy Maverick is a Handsome male!!! He truly has a good life and loving people to take care of him. God Bless Maverick to have a long and healthy life. Take care of your boy and he will take care of you!